Having a good estimate of how much endowment income your department will receive in the coming fiscal year helps in many ways. It allows more accurate estimates of how much money is available to fund scholarships thus helping with determining the number and amount of awards to make. It also helps determine the budget for ongoing programs that are funded by endowment income. Lastly, knowing the amount of support available for professorships and chairs is an important factor in developing good budgets. There are two different ways to perform the estimate that we’ll explain further in this document. Calculations are the same for quasi, true, and term endowments invested in the unitized pool. These methods are not appropriate for funds separately invested or for Social Choice Pool endowments. Method 1: Estimate based on most recent quarter’s distribution (distributions received in quarters through 06/30/19). The amount of distribution received in an expendable activity for the most recent quarter end. This information is available from your management reports. To calculate the estimated income available in the next fiscal year, inflate or deflate the distribution in #2 by the percentage in #1 times 4. For example, if you received $1,042.97 in the last quarter, you would receive an estimated $4,204.42 in the 2019-2020 fiscal year for that endowment (1.0078 x $1,042.97 x 4). The percentage increase or decrease is determined by the Manager of Endowment and Investment Accounting annually once December 31st unit market values are calculated. The percentage, once calculated, is fixed for the next fiscal year. This method assumes that the number of units “owned” by a particular endowment does not change. Changes in number of units, either up or down, will result in a change in the overall distribution. The ending pool unit market value from the most recent quarter end. For the quarter ended December 31, 2018, that value was $209.73 per unit. This value is calculated by the Manager of Endowment and Investment Accounting quarterly and will be communicated via FBS News. The 12-quarter average unit market value for the fiscal year. For 2019-2020, this figure is $220.45 and is fixed for the coming fiscal year. This figure will be calculated annually after the December 31st quarter ends. The spending guidelines. Currently, the spending policy is 4% of the 12-quarter average unit market value on an annual basis. This amount is distributed quarterly based on the number of units an endowment holds. The guidelines tend to remain stable from year to year. Any changes will be communicated. 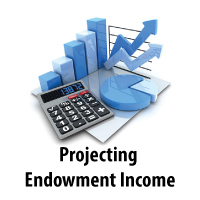 To calculate the income available, you first determine the number of units an endowment has. Take the most recent quarter ending market value and divide by the pool unit market value in #1. For example, an endowment with $100,000 in market value would have 476.80 units ($100,000/$209.73). Unless there are new gifts or additions or withdrawals (in the case of quasi or term endowments), the number of units will remain the same. Market value does not have an effect on the number of units. Second, take the number of units times the 12-quarter average pool unit market value times the spending policy to get the annualized amount of income distributed to the spending activity. Continuing our example, the annualized distribution would be $4,204.42 (476.80 x $220.45 x 0.04). As you can see, the two methods result in the same answer in this example. If, however, an endowment’s units change, then method 2 provides more precision during a fiscal year. For endowments for which the distribution is split, or partially reinvested in the endowment, only Method 1 will work. If there have been changes to an endowment’s book value (or historical cost) Method 1 will be less precise depending on the magnitude of the change. In the case of additional gifts, the risk is that the estimate will be low. In the case of withdrawals (generally applies only to quasi endowments), the estimate will be high. It is recommended that departments maintain a list of their endowments containing information pertinent to the projection process. For example, identifying which have splits, which may be exceptions, and which method appears most appropriate would be good documentation to have. The key is to know your endowments. These methods assume that the spending rate does not change. For example, because of a recent economic situation, the spending rate was reduced from 4% to 3% for the quarter ended 12/31/08 and remained at 3% until it was changed back to 4% for the quarter ended 12/31/09, due to the improving economic conditions. For questions regarding this document, please contact Dave Heaps. Feedback on this document and these processes is welcomed – if you run into situations that should be included in the Cautionary Notes section, please let us know.